Sign Up for free to save time shopping Karing Kind Labs's wholesale products on LeafLink. Karing Kind Labs has been researching and developing Co2 extracts since Colorado legalized commercial cannabis in 2010. We have developed a new line of vape products that are specifically designed for our Karing Kind Labs pure uncut oil and our cannabis distilled terpene rich oils. Our carts are unique because we use a wickless system with a ceramic coil and are made without the use of any adhesives, so you don’t have to worry about consuming anything other then what is intended. OUR DISPOSABLES ARE DEPENDABLE and over the last 2 years we have rigorously field tested them. Not only did they perform exceptionally well, but all of our cartridges and disposables have a documented failure rate of 2% – even after being abused and exposed to extreme conditions and harsh climates (hot car in summer, ski slopes in winter, etc). When we began developing our CBD Tincture Drops, we had three clear goals: a purer product, accurate dosing, and flavorless (so you can add to any drink or dish). Each tincture is produced using only three ingredients: the finest CO2-extracted cannabis oil, hemp extract, and coconut oil. 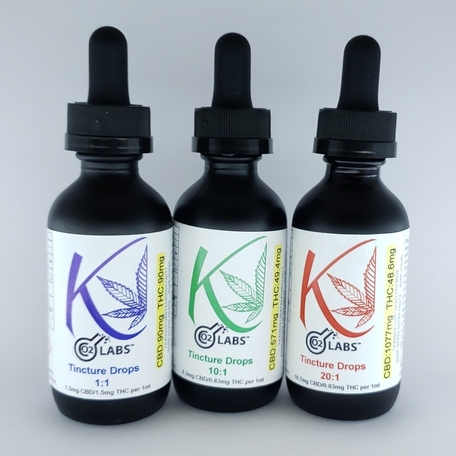 A full dropper delivers a 1mL dose, and individual serving sizes are clearly labeled so you know exactly how much active CBD and THC you're getting. Available in 1:1, 10:1, and 20:1 CBD/THC. 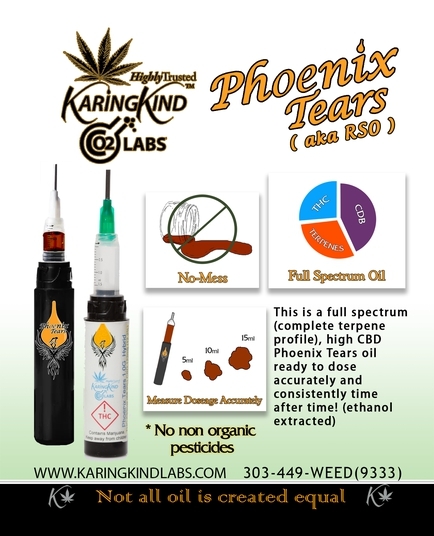 Karing Kind Labs has been researching and developing Co2 extracts since Colorado legalized commercial cannabis in 2010. 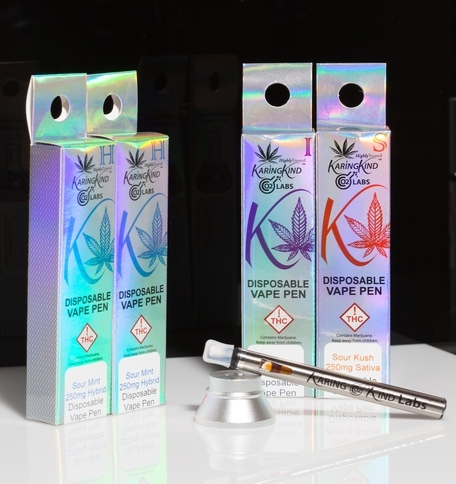 We have developed a new line of vape products that are specifically designed for our Karing Kind Labs pure uncut oil and our cannabis distilled terpene rich oils. OUR DISPOSABLES ARE DEPENDABLE and over the last 2 years we have rigorously field tested them. Not only did they perform exceptionally well, but all of our cartridges and disposables have a documented failure rate of 2% – even after being abused and exposed to extreme conditions and harsh climates (hot car in summer, ski slopes in winter, etc). Our cartridges are a great alternative if you are seeing high cartridge return rates at your store. Our Full Spectrum CBD Body Oil was developed to soothe and relax the body using minimal and clean ingredients. It is designed to heighten the massage experience with CBD. It was formulated for most skin types including sensitive skin! Our unscented Massage Body Oil is high in CBD and designed to be mixed with your favorite body oil as a CBD enhancer, but can also be used by itself. The airless pump bottle it comes in helps keep it fresher, longer and allows for accurate dosing each use. Each unit has 100mg cbd. Ingredients: Coconut Oil & Co2 extracted cannabis oil. Custom formulated salve designed using simple ingredients with highly sensitive skin care in mind. This salve has a smooth texture from the Shea butter and coconut oil that quickly absorbs and moisturizes. Contains a very subtle floral smell of eucalyptus and rosemary. Apply liberally and allow 3-5 minutes for the oil to be absorbed. Repeat this process throughout the day as needed. You can easily mix our CBD salve with your favorite lotions or salves as a CBD enhancer if desired. HAS NO PSYCHOACTIVE EFFECTS. Karing Kind Labs is different because our oil is PURE with no harsh chemicals. The only ingredients used during extraction and processing are Co2 and naturally grown cannabis sourced from our own garden! Not only is our oil among the cleanest available on the market, but it also has a high terpene profile giving a flavor that's near impossible to beat. Trust what you consume. We never use NON ORGANIC pesticides in our manufacturing process. Our artisan crafted oil comes in a metered applicator we call the 'CyKlone' (allowing for consistent dosing time after time). It comes complete with a filling tip for filling your own hardware. 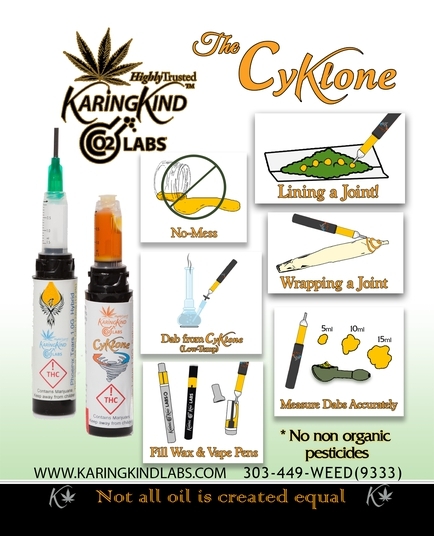 Refill your own cartridges, wax/ concentrate pens, dab strait from the applicator or even top bowls and joints with ease of the cyklone system. We have CBD cartridges in 1:1 2:1 and 10:1 (CBD:THC). 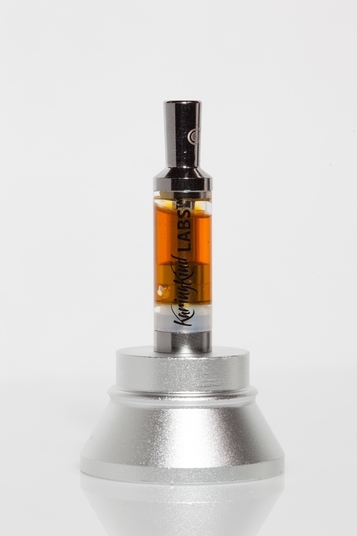 As well as high THC CO2 oils Cartridges. Karing Kind Labs has been researching and developing Co2 extracts since Colorado legalized commercial cannabis in 2010. We have developed a new line of vape products that are specifically designed for our Karing Kind Labs pure uncut oil and our cannabis distilled terpene rich oils. Our carts are unique because we use a wickless system with a ceramic coil. Our cartridges are made without the use of any adhesives, so you don’t have to worry about consuming anything other then what is intended. OUR CARTRIDGES ARE DEPENDABLE and over the last 2 years we have rigorously field tested them. Not only did they perform exceptionally well, but all of our cartridges and disposables have a documented failure rate of 2% – even after being abused and exposed to extreme conditions and harsh climates (hot car in summer, ski slopes in winter, etc). *Industry standard 5.10mm threading compatible with almost every 5.10 vape pen on the market.